How Are Invasive Species Harmful? 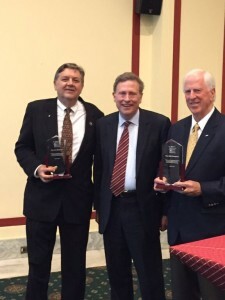 June 25th, 2015—RRISC holds its second annual Congressional Reception and Awards Ceremony on Capitol Hill. Over 140 guests and three members of Congress were present to support RRISC’s work to reduce invasive species damage across the country as well as honor four awardees who have proved that it is feasible to reduce the risks invasive species pose to our environment, economy, and public health. The Honorable Mike Thompson (D-CA) and The Honorable Dan Benishek (R-MI) were recognized for their outstanding achievement as legislators. The Nebraska Weed Control Association, Wake WorX LLC, and the Great Lakes Fishery Commission were also recognized for their achievements in providing innovative solutions to invasive species problems. In addition to honoring the awardees, the attendees were able to speak with representatives from our generous sponsors Syngenta, The Wine Institute, Dawson and Associates, Metropolitan Water District of Southern California, and Wake WorX. Attendees could also use an online mapping service to identify invasive species occurrences within individual congressional districts, and handle representative invasive species artefacts, courtesy of the National Invasive Species Council.